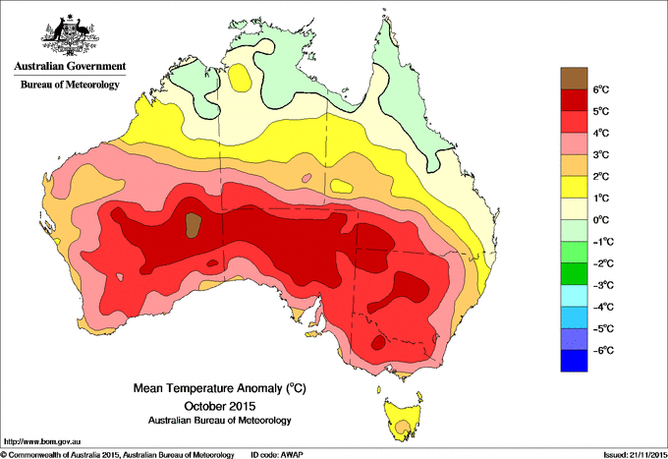 We’re not even halfway through the year but already you may have heard talk of 2016 being the hottest on record. 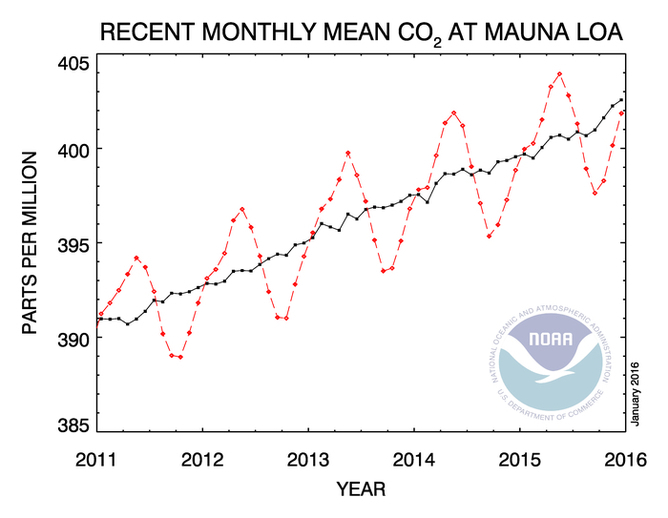 But how can scientists be so sure we’re going to beat the previous record, set just last year? Even before the end of 2015, the UK Met Office was forecasting with 95% confidence that 2016 would beat the record. Since then, that confidence has grown still further, as record after record has tumbled. April 2016 broke the record for the hottest April after we had experienced the hottest February and March on record already this year. NASA climatologist Gavin Schmidt recently estimated at least a 99% likelihood of 2016 being hotter than 2015. The main reason why scientists are so sure that 2016 will be the hottest year is El Niño, which is associated with warmer sea surface temperatures in the eastern Pacific Ocean. 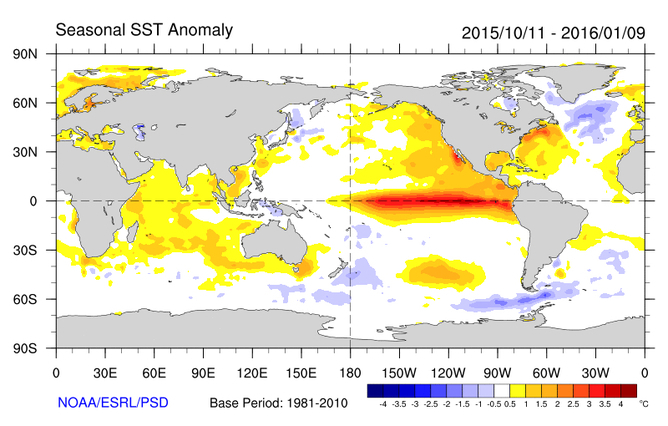 The 2015-16 El Niño was among the strongest on record and has increased global average temperatures. Even though the El Niño is now decaying, the second year of a major El Niño event is often associated with much warmer than normal conditions and is typically warmer than the first. For instance, the 1997-98 El Niño was by some measures the strongest on record, and contributed to 1998 becoming the hottest year on record globally at the time. Since the start of this year, we have seen global temperature records smashed time and time again. This means that much colder temperatures for the second half of the year would be needed for 2016 not to surpass the 2015 record. Even a strong La Niña event (the cooler opposite of El Niño), which some analysts are forecasting, is unlikely to produce cold enough temperatures. One thing that could prevent 2016 becoming a record-breaking hot year is a major volcanic eruption in the tropics. Volcanic eruptions at low latitudes can eject aerosols high into the atmosphere reducing the amount of energy from the sun reaching the Earth’s surface. Previous eruptions such as Pinatubo in 1991 and Tambora in 1815 (which caused 1816 to be “the year without a summer”) reduced temperatures across much of the globe. However, it is the year after the eruption that often experiences the most severe cooling, so an eruption would have to be pretty soon and very strong to scupper 2016’s chances of being the hottest year on record. The role of climate change is smaller because we’re comparing 2016 with last year (the previous record). Over such short periods of time, the contribution from global warming doesn’t change much. However, scientists estimated that 2015 was about 1℃ hotter than it would have been without human-caused climate change. As the human influence on the climate has not increased greatly since last year this 1℃ estimate will also apply to 2016. The highly likely record temperature of 2016 will join the previous 17 record-breaking hot years back to 1937 which were all made more likely due to human-caused climate change (the rising global temperatures were even noticed as far back as 1938). So even if El Niño is driving the 2016 record, we can say that the temperatures of this year (and indeed the temperatures associated with all the records over the last few years) would be virtually impossible without climate change. Climate change has been increasing the likelihood of global temperature records for many decades. The vertical red bars show the record-breaking hot years we can attribute to human-induced climate change. 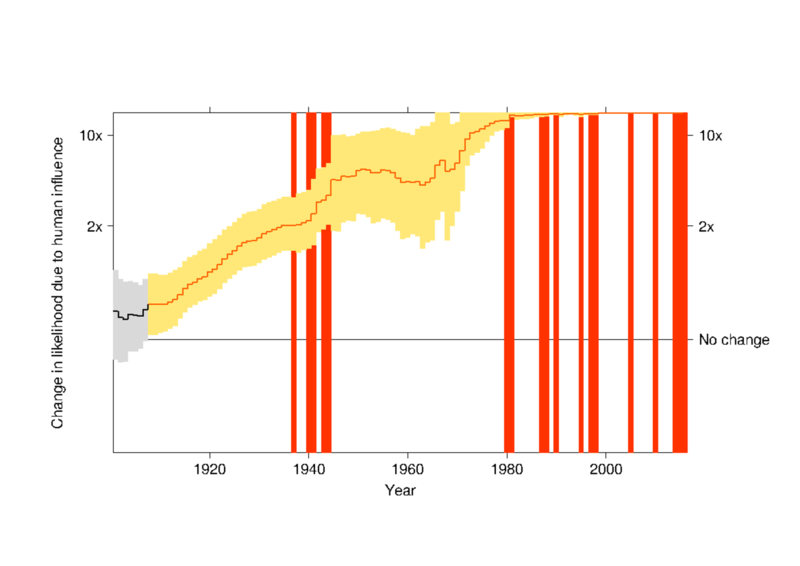 The shorter yellow bars show ranges of estimates for how much more likely a record hot year becomes each year. An omen for the future? We expect 2016 to beat the 2015 record for global average temperature as the decaying El Niño event pushes up surface temperatures. This year, we’ve already seen devastating events associated with unusually warm temperatures, like the mass coral bleaching in the Great Barrier Reef, which has been largely attributed to human-induced climate change. In future, we can expect to see more extreme heat events, like we’ve already seen in 2016, impacting society and ecosystems across the world. And even though 2016 is likely to be the hottest year by some margin, we wouldn’t bet on this record lasting too long. While 2017 is very likely to be cooler due to a possible La Niña, with the strong warming trend the world’s experiencing it’s only a matter of time before we have another record-breaking hot year. Only if we substantially reduce our greenhouse gas emissions now will we see the benefit of fewer record heat events in the future. Comments compiled with the assistance of the Australian Science Media Centre. The link below is to an article reporting on the death toll for elephants in just one year – 35 000 individuals.